To register for an event, you must first sign the legal release and pay for your membership, which is used to offset insurance fees. LEGAL RELEASE: All players must sign the legal release before playing. You must be at least 16 years of age to play, and if you are under the age of 18, you must have a parent or legal guardian sign the release. 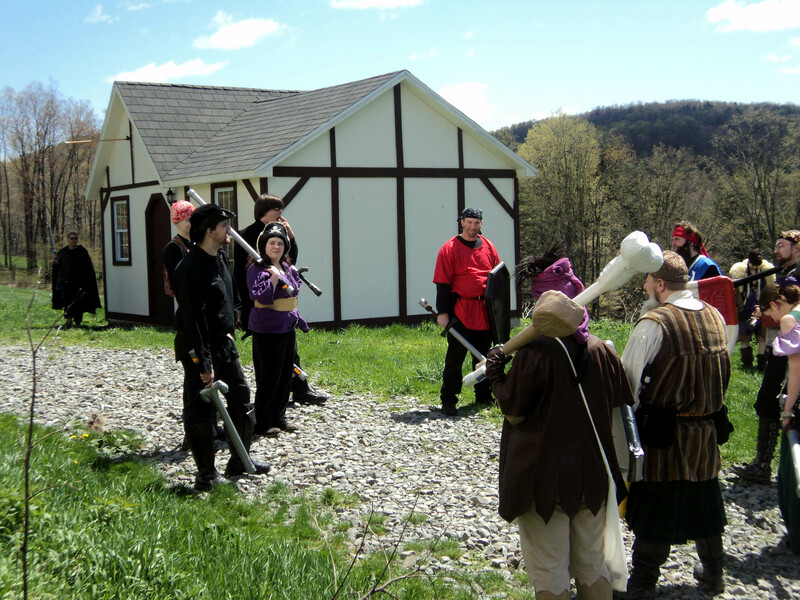 You can download the release here and either bring it to the event or mail it to Faire Play, PO Box 349, Tannersville, PA 18272. MEMBERSHIP: There are three kinds of memberships. New Player: A brand new player to the Headquarters chapter can purchase a three month trial membership for $10. This is not renewable. Event: An existing player (PC or NPC) can buy a membership for one event only for $10. Renewal: An existing player can buy a year’s membership for $30. If you plan on attending at least three events per season (as a PC or NPC), this is the best one to get. Since we have at least six or seven events a season, you’ll save quite a bit of money. WEEKEND EVENT: If you are paying for more than one person or if the name of the PayPal account is not the same as the person who is registering, please note that in the “notes” section of the PayPal form to make sure everyone is accounted for. You can also check the “Headquarters” section of the Bulletin Board where we list who has pre-registered. If you do not inform us otherwise, we will assume that you are pre-registering for the next scheduled event. HOUSING: The Faire Play site has a number of cabins and rooms that are available for players at no extra charge. If you want to reserve a cabin for your group, you must have at least four players pre-registered. There are also three small private rooms available in the main building. They can hold up to four people comfortably. These rooms are $40 extra per weekend and can be reserved on a first paid first served basis. To reserve a room, use the “donate” button and leave a note stating that the donation is for one of these rooms. You must have already reserved to play for the event before you can reserve a room. Be sure to check the appropriate message board (Ashbury or Stormbreak) before trying to reserve any these spaces to make sure they are available. DONATE: We will give you 3 goblin stamps for every dollar donated. Please note that Faire Play, Inc. is a for-profit corporation, and your donations are not tax deductable. We do promise, however, to use all donations for improving the Faire Play site. DEADLINES: The deadline for pre-registering is midnight on the Sunday before the event. If you sign up after that time, your registration may not be acknowledged and you will have to pay at the door and pay the door price with is an extra $10. Once the event is over and we see your payment, we will of course either refund that extra money or give you credit for a future event. If you would prefer not to use PayPal, checks and money orders can be mailed to Faire Play, PO Box 349, Tannersville, PA 18372. Once you have paid for the event, you can go here to choose your skills and spells so that when you check-in, everything will be ready for you.